It was late July 2018 when the Mendocino Complex wildfire broke out in rural Lake County, California. It burned more than 450,000 acres and destroyed 280 structures before it was contained. Ana Santana managed to fill some storage bins with sentimental items – her kids’ blankets, pictures, and art projects – before fleeing her home. Santana is the facilitator of the Lake County Children’s Council and Program Director for Healthy Start Youth and Family Services, where she and her team provide home visits, parenting classes, and resource connection. Her evacuation experience gave Santana more empathy for her clients’ desperate situations. “Working in the shelters and with families afterwards, I think that was worse than if I had lost my home. Hearing the pain, the desperation in people’s voices…you can never be prepared for that,” relayed Santana. A lot of times, we think that because a child is going to school or playing at recess, he’s back to normal and has forgotten everything that’s happened. But that’s not true. Thanks to some countywide efforts, Santana and her team have been using a trauma-informed care approach to help families recover from this and other negative experiences. Trauma-informed care (TIC) is understanding and responding to trauma by using principles that cultivate safety, empowerment, and healing. The National Child Traumatic Stress Network identifies natural disasters as one of 12 types of trauma that most commonly affect children and adolescents. Although natural disasters are considered “tolerable stress,” other types of trauma can create a cycle of toxic stress that is harder to break. Studies show that toxic stress can disrupt not only mental health over the long term, but also physical health. In Lake County, Susan Jen is the director of the Health Leadership Network. She acknowledged that, over the past decade, high rates of poverty and domestic abuse, along with drugs and alcohol misuse, have contributed to Lake County’s poor health rankings. “We could statistically make a case for needing cross-sector, collective wisdom on how to address these issues we were dealing with,” said Jen. Visits from professionals like Dr. Vincent J. Felitti, one of the world’s experts on adverse childhood experiences (ACEs), were instrumental to organizations like Jen’s regarding their approach to community health. One of the actions the Health Leadership Network took was creating the Lake County Wellness Roadmap, a project funded by the Health Resources and Services Administration (HRSA), which included addressing exposure to trauma and resiliency-building through countywide collaboration. The Network also formed a Trauma Guide Team to help organizations work together through a common lens. Santana was appointed as the Guide Team’s facilitator. She helped bring in Strategies 2.0, a statewide family support entity, as a resource to train the team on the effective use of TIC. “We’re in an isolated place, so it’s very hard to get our people trained in an effective way,” explained Santana. Ana Santana, Facilitator of the Lake County Trauma Guide Team. Photo Credit: Carolyn Jones, EdSource. Next, the Guide Team created a multidisciplinary approach to carry out trauma-informed care throughout the community. By engaging healthcare, social services, and other agencies across the county, the Health Leadership Network made sure entities with the potential of treating trauma victims were on the same page. In addition, healthcare facilities across the county have adopted the use of evidence-based screening tools and other TIC approaches. Some came up with their own strategies: the Lake Family Resource Center developed California Hope to provide ongoing emotional, mental, and day-to-day support for wildfire victims. Adventist Health Clear Lake established Project Restoration to serve patients with housing needs. Lake County Tribal Health uses the Circle of Security to help Native American families and children who have suffered trauma. Another example of a statewide effort that helps rural communities become trauma-informed across all sectors is Elevate Montana, initiated by ChildWise Institute. One of their initiatives is Handle With Care, a partnership between local law enforcement and schools. Here’s how it works: If a child is found on the scene of a disturbance or crime, police notify the school and report only the child’s name and the words “handle with care.” The code respects the child’s privacy while alerting school staff to take action, whether allowing additional time on homework, referring them to the school counselor, or simply being extra sensitive to the child’s emotional state. As Tina Eblen, director of ChildWise Institute and Elevate Montana, explained: “It’s understanding that, when [the students] go home, they are dealing with a lot. So making the school an environment that provides compassion and care for these kids versus being punitive is important.” By applying this trauma-informed approach, schools in rural towns like Libby and counties like Pondera are creating safe spaces for children to build resiliency in the face of adversity. Elevate Montana was one of 14 communities selected by Mobilizing Action for Resilient Communities (MARC) to participate in a learning collaborative that builds policies and practices to improve resilience. Trauma-informed care has become increasingly recognized as a response to trauma within and outside of the medical setting. Since knowledge of the widespread impact of trauma has increased, more classrooms, workplaces, and even media are using TIC approaches. Some experts even suggest that trauma should be considered a public health concern because of its link not only to mental and emotional health, but also long-term physical health. Dr. Bird Gilmartin is a pediatrician at Evanston Regional Hospital in Wyoming who uses a trauma-informed approach when treating patients. She explained that trauma due to adverse childhood experiences can manifest itself in different ways: “It affects everything and goes throughout an entire family and masquerades as all kinds of things. It looks like poor sleep, failing grades, bad moods, and health problems,” explained Gilmartin. Dr. Bird Gilmartin uses a trauma-informed approach when treating her patients. Find out more about the effects of trauma and how a facility can become trauma-informed from the top down in this video, created through Advancing Trauma-Informed Care, a national initiative led by the Center for Health Care Strategies through support from the Robert Wood Johnson Foundation. While Evanston currently has mental health professionals willing to see children for pediatric trauma, none are trained to deliver Trauma-Focused Cognitive Behavioral Therapy (TF-CBT), a treatment often used to address trauma symptoms in children and adolescents. This is what makes Gilmartin’s work with Dr. Brooks Keeshin unique. 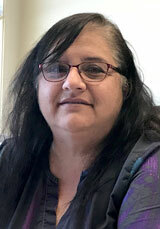 Keeshin is a pediatrician and psychiatrist who specializes in child abuse pediatrics at the Center for Safe and Healthy Families (SHF), a division of the Primary Children’s Hospital in Salt Lake City. He is coordinating training for 15 Evanston providers in TF-CBT later this year. “It was like finding a unicorn,” she said. 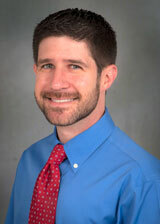 “[Pediatricians] are not child psychiatrists. We don’t have training in ADHD, PTSD, suicide, depression, or anxiety. This relationship with SHF allows us to expand these kinds of services safely and appropriately,” explained Gilmartin. In 2018, Gilmartin agreed to become a pilot site for a project Keeshin is leading as a part of SAMHSA’s National Child Traumatic Stress Initiative. 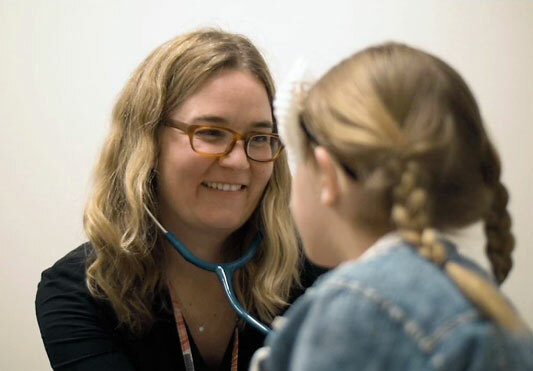 The pilot project consists of developing a pediatric-based trauma assessment and decision support tool to help primary care clinicians identify ACEs and treat trauma. Gilmartin had already been using the American Academy of Pediatrics’ four-step process, but the 13-question survey has given her a tangible resource to use at every well-child check, sports physical, and behavioral health consultation. The screening tool has three main components: to identify trauma in a patient’s history, to discern the severity of symptoms and the need for evidence-based treatment, and to pinpoint the risk for self-harm or suicide. “We’re not trying to turn [primary care providers] into mental health professionals, but we’re giving them something they can do with a family in crisis right then and there to help with the child’s trauma-related stress in a meaningful way,” said Keeshin. Here’s how it works: First, a survey is filled out in the waiting room by the child or parent. Then, it’s assessed by the medical provider. If trauma-related symptoms are identified, the provider teaches coping skills like belly breathing or behavioral activation. Using an algorithm, the provider can determine if more serious action needs to be taken, like contacting child protective services, conducting further evaluation of suicidal symptoms, or referral for evidence-based trauma treatment. The survey has several questions about sleep patterns because “it’s very common for a kid to have disturbed sleep when they are having traumatic stress symptoms,” said Keeshin. For one of Gilmartin’s patients, the screening tool detected sleep problems influenced by a traumatic experience. She took action by reaching out to the child’s therapist to make sure the trauma treatments they each were providing were complementary. Next, she called Keeshin to get advice about the sleep problems. He recommended a treatment and agreed to see the patient for a psychiatric evaluation. Trauma-specific treatment uses evidence-based and best practices to help people heal from trauma. SHF is one of 100 sites that received this SAMHSA grant to address trauma, and it is one of a few that are focusing on addressing childhood trauma within a medical system. SHF is also developing web-based training tools, videos, and apps to give providers easy access to helpful tips. The pilot project is entering its final stages before being evaluated by Intermountain Healthcare System later this year. Learn more about the National TeleNursing Center’s Sexual Assault Nurse Examiner program in RHIhub’s Rural Health Models and Innovations. Nurses also play an important role in delivering trauma-informed care in a medical setting. Often the first medical providers to talk with a patient during a clinic or hospital visit, they are in the position to help patients feel more comfortable disclosing traumatic experiences. This is especially important in cases where sexual assault was involved. The National TeleNursing Center (NTC), operated by the Massachusetts Department of Public Health, was developed to offer direction to remote nurses during sexual assault examinations and the collection of forensic evidence. Through a video conference, Sexual Assault Nurse Examiners, or teleSANES, guide rural nurses through exams using a trauma-informed approach. You can’t just have trauma-informed care for patients where there are lots of experienced providers. After researching multiple nursing care theories, NTC adopted the Quality Caring Model©. Petricone helped adapt the model to fit their program. “Out of all the theories, this one meshed the best with what we were already doing at the Center,” she said. The model includes eight caring behaviors for nurses to use: mutual problem solving, attentive reassurance, respect, encouragement, appreciation of unique meanings, healing environment, human needs, and affiliation. All are well aligned with approaches in other TIC models of care. Being mindful of the patient’s fragile condition at the time of the exam, teleSANEs take extra precautions to help the patient feel comfortable being a part of a telehealth consultation. For instance, the teleSANE shows the patient that there is no one else in the room, assures the patient that the room is soundproof, and asks permission before continuing each step of the exam (involving the patient in decision-making is one of SAMHSA’s six guiding principles of TIC). Randi Petricone (left) connects with NTC Educator Rachel Preiss using their telehealth equipment. Photo courtesy of the Massachusetts Department of Public Health. NTC has been proactive about this. After each exam, the teleSANE debriefs with their remote site nurse, providing tips and guidance on how to best recuperate from that experience. Courtesy of the Center for Health Care Strategies’ Key Ingredients for Successful Trauma-Informed Care Implementation issues brief. Whether face to face or through a screen, using a trauma-informed approach is the first step to identifying the “why” behind the “what.” Gilmartin acknowledges that trauma is hard to talk about, especially in a small community where anonymity is hard to come by. “People don’t want to talk about the fact that things like child abuse exist,” said Gilmartin. But to her, once you learn about the effects of trauma, there’s no ignoring it. Quite the opposite: Identifying the trauma is the first step to healing. Although there is not much difference in the types of trauma experienced from urban to rural populations, the availability of resources and personnel to treat them differ. Nevertheless, Gilmartin urges rural providers to give trauma-informed care a chance. This entry was posted in Features and tagged Abuse and violence, Behavioral health, California, Children and youth, Families, Health screening, Massachusetts, Mental health, Montana, Nurses, Primary care, Telehealth, Utah, Wyoming on April 17, 2019 by Jenn Lukens.